Sure looks good to us. A woman got punched by a complete stranger as she pushed a stroller with two small children along Clark Street Wednesday morning. 19th district officers successfully tracked the offender down and made an arrest. Police met the victim at Clark and Surf around 11AM and immediately began searching Diversey between Clark and Sheridan for the alleged attacker—described as male, black, bald, 5’10” tall, wearing a gray shirt and khaki shorts. Within minutes, they found their man outside a service agency in the 2700 block of Lakeview Avenue. He was positively identified and arrested for battery. CPD case HX385663. Details are slim following an aggravated battery with a dangerous weapon outside of the Belmont L station early Wednesday morning. 19th district officers on patrol happened upon the battery as it unfolded at 1:40AM and soon asked for an ambulance to treat the victim. The highly uncooperative offender was on the cusp of being zapped, saved only by the fact that none of the officers on-scene had a Taser. Police said that the “possible female” attacker remained highly combative and “beat up the [paddy] wagon” despite being leg shackled. Local Internet comment writers love to deride 44th ward alderman and Ann Sather restaurant owner Tom Tunney’s trademark “sticky buns." As it turns out, they may have been on to something. 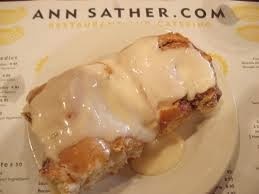 Zagat this week named Sather’s “gooey cinnamon rolls” the 4th most overrated food in Chicago. Aside from this high-calorie indulgence, the restaurant serves bland takes on eggs Benedict, biscuits 'n' gravy, pancakes and waffles. Last year, one of the four locations shut down, suggesting that it does take more than sugar and cinnamon to survive.